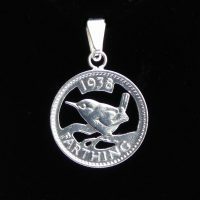 This Wren Farthing coin pendant has been hand made by cutting out the design on the original coin and then Silver plating to a high quality. On this page it is available in these years: 1937, 1938, 1939, 1940, 1941, 1942, 1943, 1944, 1945, 1946, 1947, 1948, 1949, 1950, and 1951. Have your own coin you would like cut?